Southampton will not sell forward Sadio Mane to Manchester United, insists Saints boss Ronald Koeman. 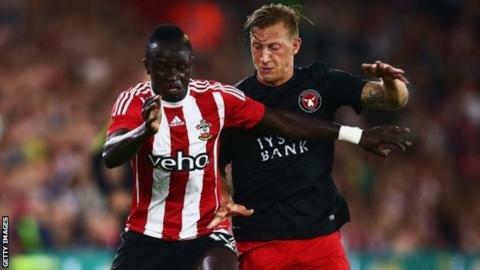 The 23-year-old Senegal international, a target for the Red Devils, played the full 90 minutes as Saints drew 1-1 with Midtjylland in their Europa League play-off first leg at St Mary's. "We're not selling any more players," said Koeman after Thursday's game. "Write what you want to about the rumours until 1 September, nobody is going to leave Southampton." Mane scored 10 goals in 32 appearances last season after joining Saints for £10m from Red Bull Salzburg, including the fastest ever Premier League hat-trick. Koeman added: "The situation is so easy and we have to deal with it. I don't like it as maybe players are thinking they're not fully focused on what they have to do. "There's no bid for any player. Not for Sadio Mane, not for Victor Wanyama. "We have to deal with rumours among the press. There's no bid for any player and no contact from any club." Midfielder Wanyama, 24, has been linked with Tottenham.